UFC featherweight champion Conor McGregor suffered his first UFC loss on Saturday at UFC 196, submitting to a rear-naked choke courtesy of Nate Diaz. The second-round finish halted McGregor's plans of taking over the welterweight division, and potentially a run at the lightweight title, as well. UFC 196’s main event was originally slated to be a lightweight title fight between McGregor and champion Rafael dos Anjos. The fight would see McGregor jumping 10 pounds in weight in an attempt to claim his second belt just months removed from dethroning featherweight kingpin Jose Aldo at UFC 194. Dos Anjos, however, suffered an injury, forcing a cancellation of the fight, which resulted in Diaz filling the void. The man McGregor was originally set to square off against at UFC 196 doesn’t see it that way, though. Appearing on Monday’s edition of the MMA Hour, dos Anjos reminded everyone Diaz is a lightweight fighter most of the time. So, if McGregor couldn’t beat Diaz, how would he ever hope to beat the champ? "A lot of people say, ‘Ah, Conor went up two weight divisions.' No. Nate Diaz, he's a 155-pound fighter. He's a lightweight. And [McGregor] is saying that, ‘I went up two weight divisions.' No. He did not fight Robbie Lawler. He did not fight Johny Hendricks. He fought Nate Diaz, which is 155. He would continue, “I just think Conor doesn't deserve to fight for this, for the 155 belt. He just got smashed by the No. 5 ranked (fighter)." 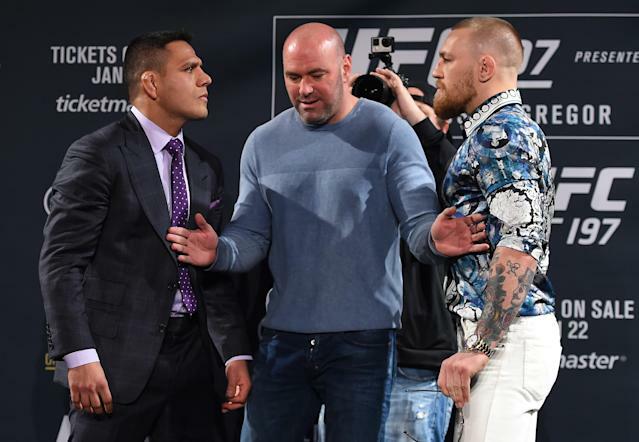 Prior to the main event change at UFC 196, Dos Anjos and McGregor exchanged numerous verbal jabs (mostly on the Irishman’s end) in the media and during one particularly memorable press conference in February. Looking back on the words said, and the outcome of UFC 196 still fresh on everyone’s mind, dos Anjos couldn't help but pile on. "For me, I don't care [about] anybody's loss," dos Anjos said. "I think it's a loser's mentality to get happy with somebody losing. I don't think like that, because one day I'm going to be there, on the Octagon, stepping there. So I don't want anybody cheering for me to lose. I don't want to be in that position. But I think everybody got what they deserve. Conor got what he deserved, and God makes everything perfect. Conor, he claimed to be God, and God made everything perfect. God showed him, the world, who [McGregor] really is." Dos Anjos would go on to say he thinks current No. 1 featherweight contender Frankie Edgar “kills” McGregor when they fight. Dos Anjos also believes McGregor’s 13-second KO over Aldo was a "lucky punch." He says McGregor is all talk and a product of hype. And now, after McGregor’s loss to Diaz, dos Anjos believes McGregor has been exposed.